I worked for JCPenney for three years when I was in high school and in college. While most of my friends were unhappy with their jobs, they didn't understand that I truly loved working as a merchandising associate in the Junior department. Not only did I have fun learning about the retail industry (which definitely helped my future career at Target Corporation! ), the pay was good and my coworkers taught me a lot about positive working relationships and teamwork. 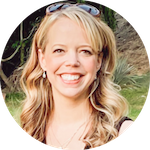 Finally, I loved that my employer was a philanthropic company that simply understood how important giving back is to both local communities and national organizations. 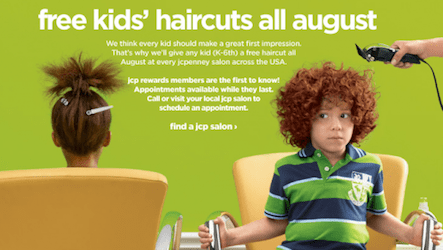 It's been years since I've worked for JCPenney, but I still appreciate the corporation, and I'm really happy to share that they're offering up FREE haircuts for kids throughout the entire month of August! $1 from every FREE haircut given on August 1st will be donated to 4-H and The Boys & Girls Club! Not only are you getting your kids a FREE professional haircut just in time for the upcoming school year, you're also helping The Boys & Girls Club and 4-H get extra cash to fund their amazing organizations! If you're child is in need of (or almost in need of!) a haircut, why not head to any JCPenney salon on August 1st and make a free donation, too! Personally, I'm going to seize the opportunity to have Haiden and Piper get their first professional haircuts. Up till this point, my sister or I have been doing them. They're definitely good enough, but I think it's time to start introducing them a real haircut process instead of seeing me wing it every time I pick up scissors! There are 949 JCPenney Salons across the nation and every single one of them are participating in this monthlong event. Find your closest salon and make an appointment ASAP! Difference made: In its 2011 Philanthropy 400 report, The Chronicle of Philanthropy placed Boys & Girls Clubs of America in the No. 1 position among youth organizations for the 18th consecutive year. Difference Made: 4-H is the nation’s largest youth development organization. More than 6 million 4-H youth in urban neighborhoods, suburban schoolyards and rural farming communities stand out among their peers: building revolutionary opportunities and implementing community-wide change at an early age. As the youth development program of the nation’s 109 land-grant universities and the Cooperative Extension System, 4-H fosters an innovative, “learn by doing” approach with proven results. Nick Stenson is a busy guy. As jcp salons Artistic Creative Director, he leads and advises 14,000 stylists and salon leaders at more than 900 salon locations, boosting their skills and their confidence. With more than 900 full-service salons across the country, jcpenney is the largest department store salon chain in the country. We offer the latest trends in cuts, coloring, texture and finishing services. jcpenney's more than 18,000 skilled salon Associates serve as trusted partners, providing our customers with inspiration. In addition to offering hair designs, using top brand hair products such as Matrix and Paul Mitchell, jcpenney salons offer professional services that include skincare, nail treatments, waxing, skincare and massage therapy. This post was provided by JCP Salons. I received a gift card in exchange for participating in the promotion (pictures to follow after our salon visit!) and all opinions expressed are 100% my own. Thanks so much for this post. This will be great for my daughter!